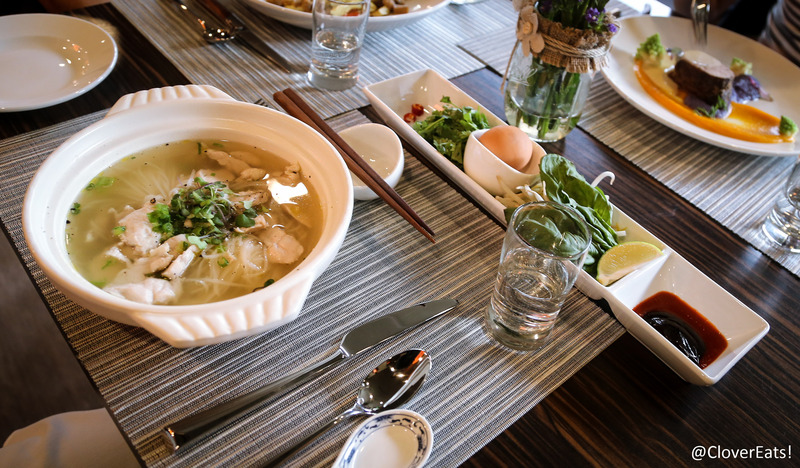 The fanciest pho ever at the new restaurant Taste Kitchen on Liberty St | Clover Eats! I was sad when the make-your-own-sushi restaurant Tamaki closed, but was excited to see signs for Taste Kitchen soon after. The same owners of Tamaki are running Taste Kitchen, but the two restaurants seem to have very different philosophies. Tamaki had pho, one of my favorite dishes, and I’m glad to see it survived the transition. Its Taste Kitchen incarnation is a lot fancier, involving an unlidding of the dish that really lets its aroma make an entrance. It also involves a side dish with a poached egg that you get to drop in yourself. The single Yelp review that was posted on Taste Kitchen page mentioned that everything was well-plated, which is definitely true. 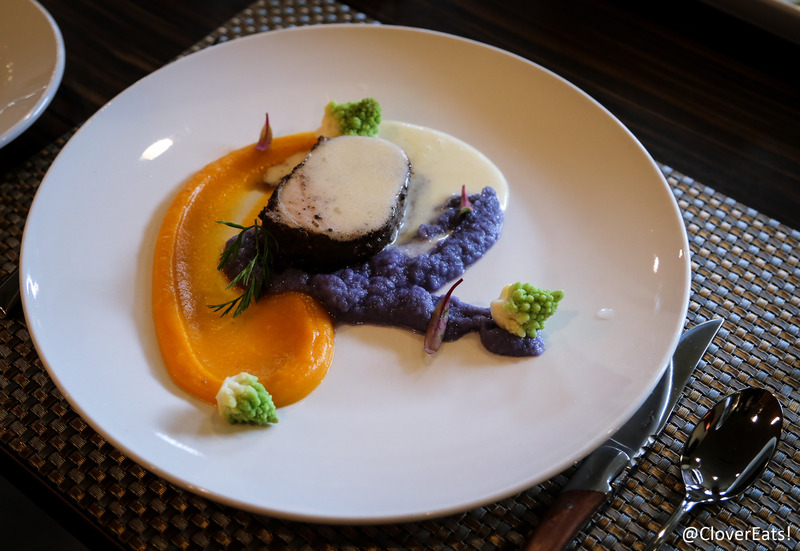 There is a focus on presentation, with active little moves like pouring sauce over your dish. Above is the succulent pork plate, with coffee, butternut squash, brussels sprouts, cauliflower, romanesca, and maple maple burre monté! The best part of this was the maple butter; it was just the right amount of sweetness. The restaurant is faintly recognizable as Tamaki, especially the televisions that are still here. I loved the rustic flower centerpieces, they felt like something off of a barn wedding Pinterest. Refreshing “Earl Grey Spritz” with basil, honey, and lemon. They were still working on getting their liquor license when we visited. A buttermilk froth amuse-bouche! It looks falsely like tofu but had a surprisingly super light texture. My friend mentioned that its heavy taste seemed to contradict its fluffiness and wondered how it would taste with something like citrus, which I thought would be interesting. They also had oysters, from Virgina, in three flavors – cocktail, lime-chili, and scallion oil. My friend Justin took the above photo! Below is the beef plate with eggplant and fingerlings and ginger-cayenne sauce. Overall, an interesting meal, with some nice presentation elements. It was on the more expensive side, but I liked the details, and our waiter was very knowledgeable about the menu. Things were a bit on the slow side, but not more than expected from a restaurant that just opened. Really want to check that out!! I liked it, and think it’s an improvement from Tamaki! Let me know what you think!